Marlie has what I call a hat face. She really looks good in hats! Me? Not so much. I am happy that I can now live out my hat fantasies vicariously through her. 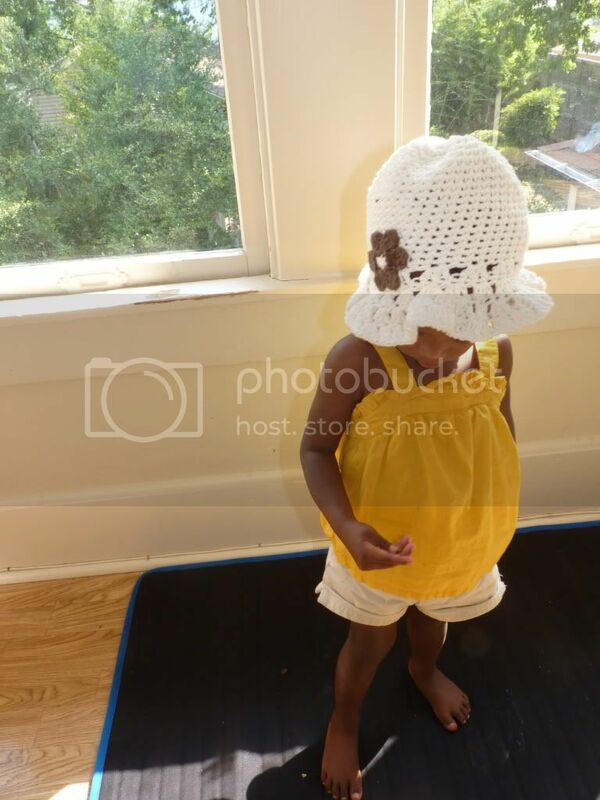 By the way, she is sporting a Beanie Designs Sunflower Bucket Hat in this photo. You can win a Beanie Designs Baby Hat of your choice in my giveaway! She does pull that off with style! I'm jealous of your little cutie. I love marlie in that hat! Jas won't wear hats although she looks awful cute in them. Love that hat...my kids have hat face too - I'm stealing that from you. I recently bought myself a big sun hat. I was horrified to see pictures of myself in it. Horrified! I can't believe how big she is getting! So tall! Oh I love that hat! I need to get some crocheted hats for Abby! That's such a cute hat! Love it. Marlie is so stylish. That hat is absolutely adorable! I wish Dora would wear hats!